Ping pong, board games, so much fun! Read a book, use as a home office, do some yoga? The sun shines here all day! 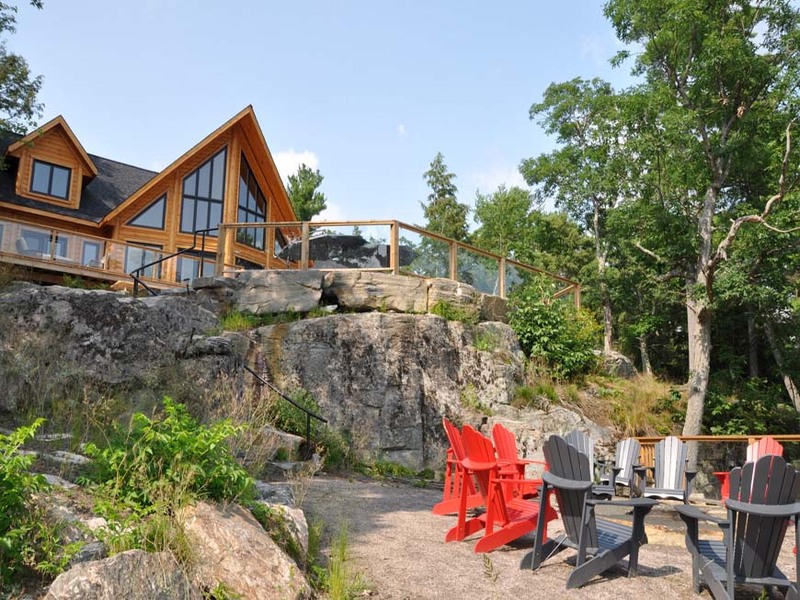 Set on a level plateau amid towering pines and Canadian Shield outcrops, this stunning modern cottage offers spectacular panoramic lake and tree top vistas, a true “at one with nature” feeling, and complete and total privacy. By its inspired design, the cottage’s indoor and outdoor living spaces flow effortlessly together, offering innumerable places to relax and read a book, take in the dreamlike sights, enjoy a meal with family, or have a drink with friends. 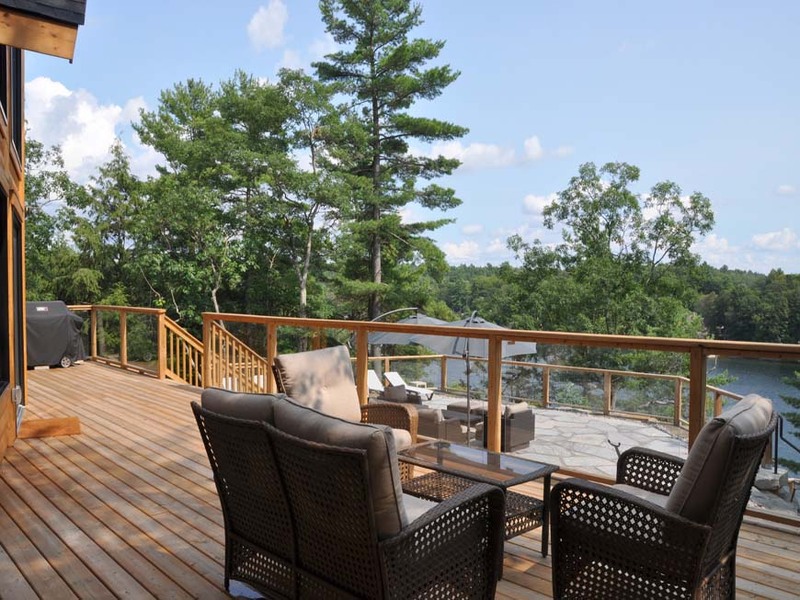 The front deck spans the entire width of the cottage, and is easily accessed from any of the living and dining areas, Muskoka room, and master bedroom. An expansive flagstone patio has ample space for conversation sets, chaise lounges, and sun umbrellas. 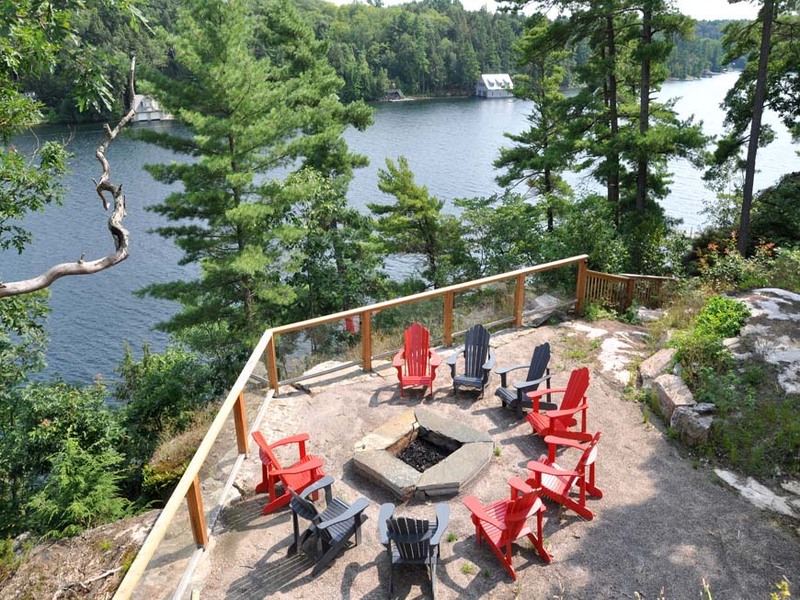 Down an awe-inspiring stone staircase threaded through sparkling granite is the fire pit area which accommodates plenty of Muskoka chairs for evening bon fires, marshmallow roasting, and star gazing. Due to the southern orientation of the property, these wonderful outdoor living spaces are drenched in sunshine all day long, and their glass railings provide maximum enjoyment of the incredible scenery. Bathed in warm, natural light which permeates through several sets of sliders and a two-storey wall of windows, the cottage interior is invariably inviting and offers different perspectives of the mesmerizing views. The Great Room, with its lofty cathedral ceiling, is anchored by the cozy propane fireplace. Guests will marvel at the beauty of the forest and lake from the dining area. The gorgeous kitchen features built-in appliances, a large island with a second sink and bar seating, and a handy storage pantry. The master bedroom has sliders to the deck, a luxurious ensuite with a soaker tub and separate shower, and a walk-in closet. 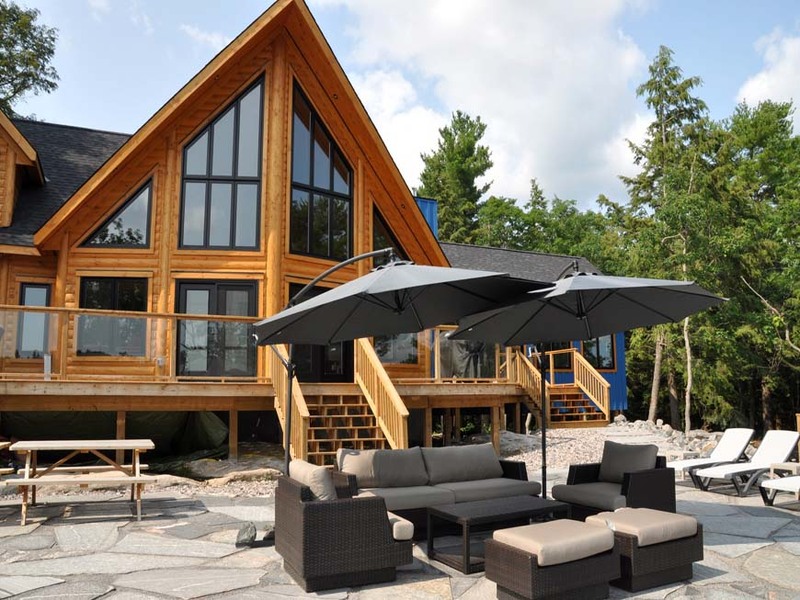 Fun and games will be had in the sprawling, 4-season Muskoka room, which provides room for a ping pong or pool table and space for everyone to gather into the family room area. The main floor, being so well thought out, is complete with a powder room and laundry room. A gorgeous, wrought iron open staircase is flanked by upper level loft areas, which make great office or reading nooks. Glass railings on the landings allow uninterrupted light flow throughout the cottage and create a wonderful, open, airy feel on both floors. The upper level is home to three full bedrooms and a lovely 4-piece bathroom. 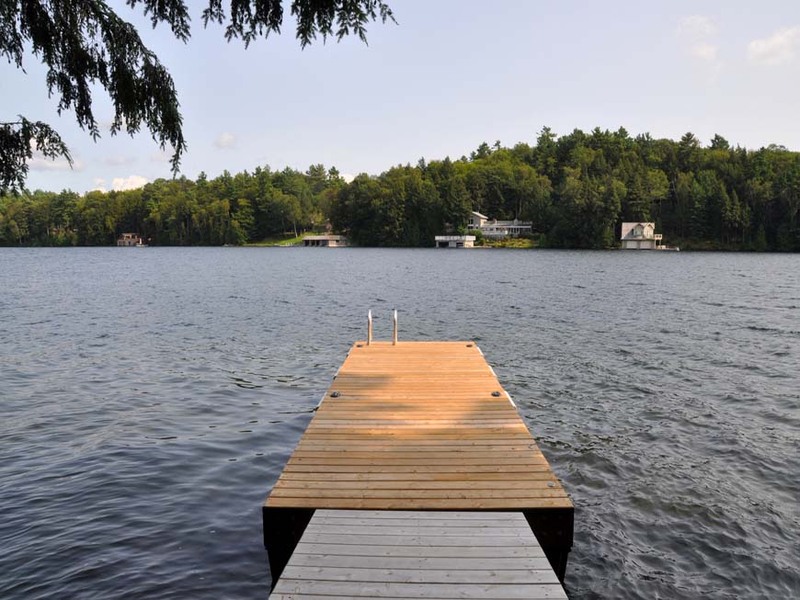 The cottage offers all the comforts needed to unwind in all four seasons, but no doubt many summer days will be spent by the lake! Footpaths laterally traverse the front of the property past breathtaking rock formations, connected with a few sets of stairs, and lead down to user-friendly land along the water, where the privacy is still exceptional. 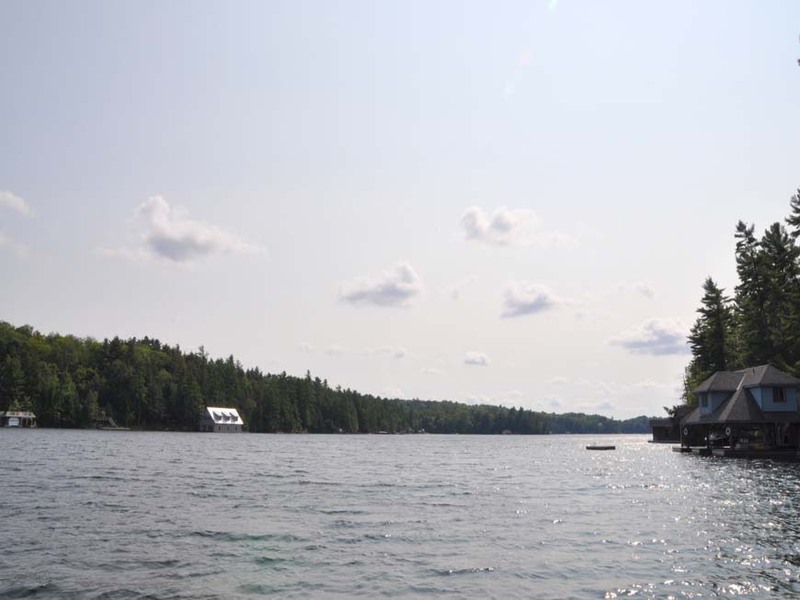 Pristine Lake Joseph awaits as refreshing deep water beckons. 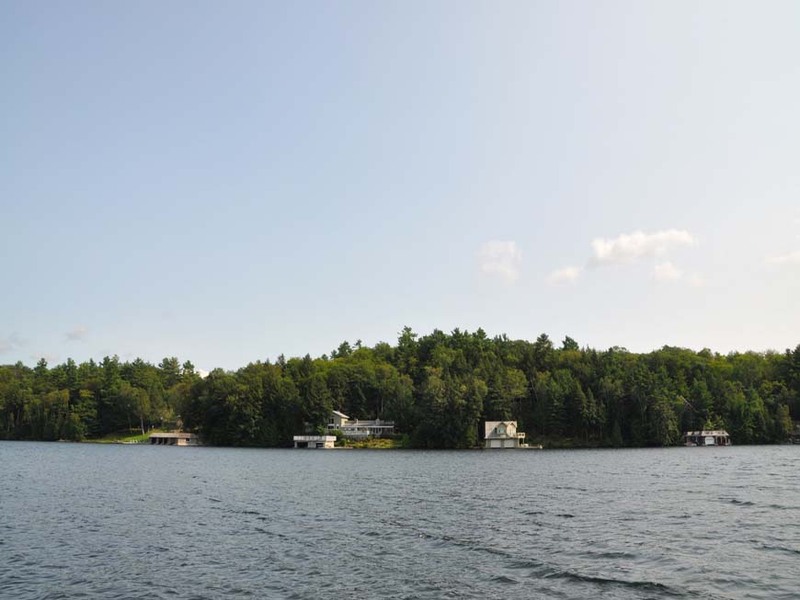 Enjoy the benefit of miles of boating on Muskoka’s most desirable chain of lakes, with Lake Joseph flowing into Lake Rosseau and eventually Lake Muskoka through the locks in Port Carling. 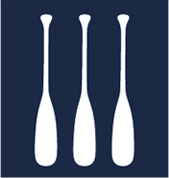 Boat to golf, dining, shopping, and innumerable other amenities and activities! 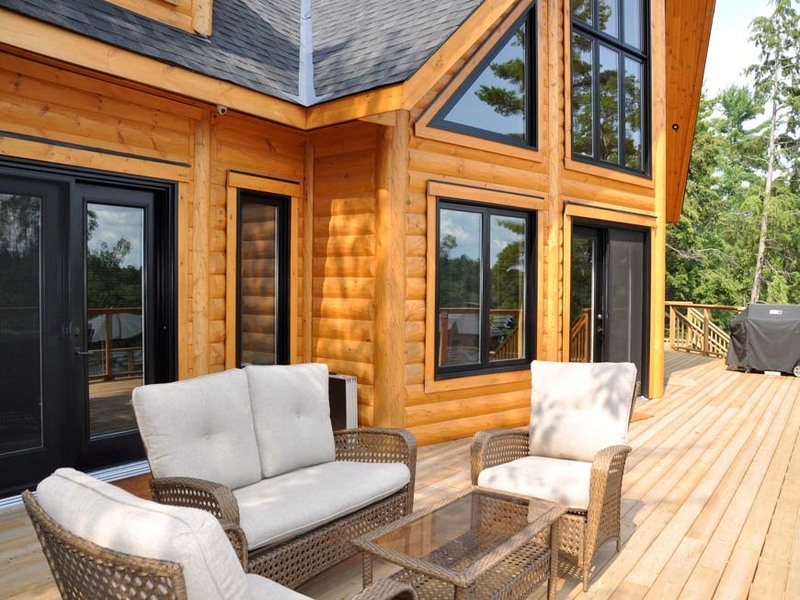 With its extraordinary privacy, captivating panoramas, sunny south exposure, skillfully designed new cottage, absolutely beautiful, one-of-a-kind landscape, and highly desirable location on Muskoka’s most coveted lake, this is a truly unique and special offering.